Just a quick post to remind you that the giveaway ends tonight! 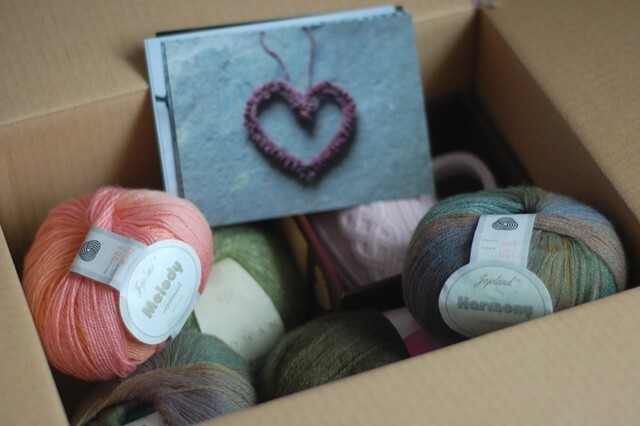 One random winner will get this box of goodies, which includes some Jojoland Harmony & Melody, and a ball of Rowan Felted Tweed among other things. I will choose two additional names to win a set of postcards each. 8th July, 2012 // Laylock // tags: giveaway. Thank you for showing how to use the thumb for ribbing. I wish I had found your video first as I have just got used to Continental Knitting. However I am having trouble with the wool being loose and falling off my thumb. Is the weight of the ball holding yours in place? I’ll keep trying your way. Are you English? I have never seen this way before and you make it look so easy. Thank you.